Today I decided to participate in my first color challenge. I suppose I chose this as my first challenge because it uses one of my all time FAVORITE color combos AND it comes from my stamping idol Dawn McVey. She is absolutely brilliant! 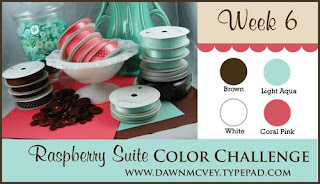 I want to be Dawn McVey when I grow up :) The colors for this challenge come from Papertrey Ink and they are Aqua Mist, Melon Berry, Dark Chocolate and White. I only own 4 PTI stamp sets and for this color combo I thought that the one that I have that lent itself the best was Bitty Baby Blessings. I used it for both cards that I made. I also used the PTI Bitty Dots patterned paper which is just the most precious stuff ever!